When I was in high school, I had an idea for an elaborate science fiction story that involved a trilogy of romances, colliding planets, extraterrestrial artifacts, and mysterious coming of age rituals. It's had a dozen different titles, but right now it's called The King of Heaven, where Heaven is a gas giant planet around which everything in the story revolves. While I have done countless drawings and outlines, written and rewritten the prologue, and changed the settings and characters a dozen times, I have yet to write a word of the body of the novel. 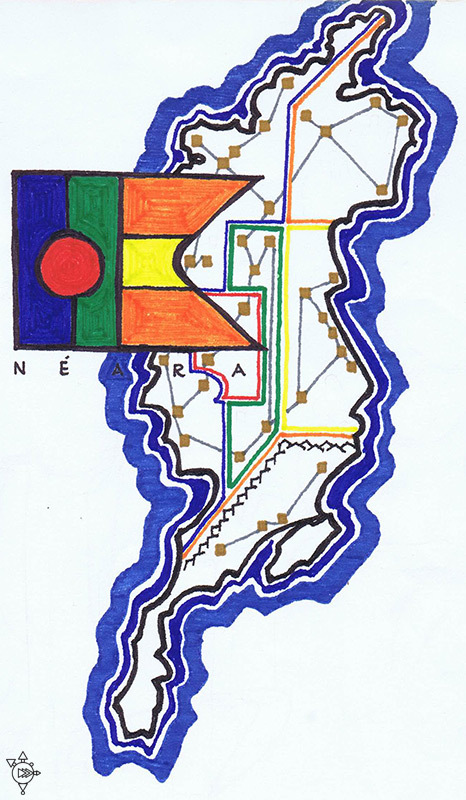 One of the curious items from my sketchbooks is this map of the island nation Néara. It was to have been populated by a race of beings that were the invention of a mad geneticist in antiquity. They were called Neadars and they were human in torso and deinonychus in the lower body. I was a kid. Leave me alone. 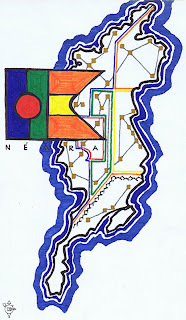 I really need to gather all of the existing notes and sketches together and get crackin' on the manuscript. I've been chewing on this project for 35 years. I think it's time to get it out and free up the space in my head. Yes, please! Love to review or just listen. You can tell such great stories.